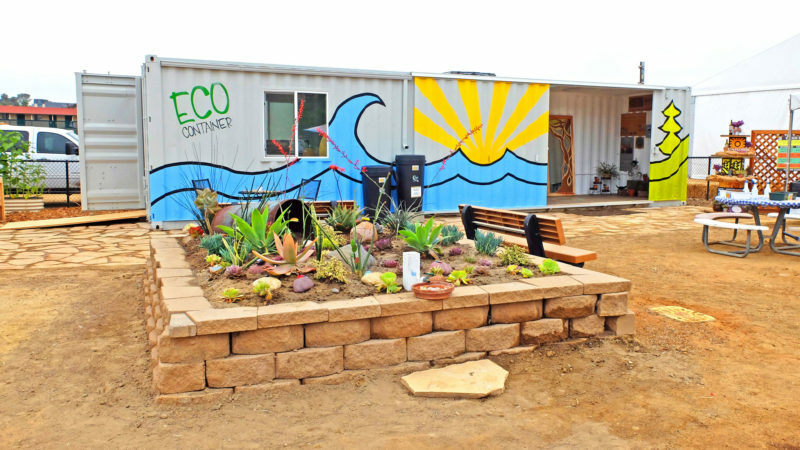 The Eco Container, a re-purposed shipping container, inspires and educates visitors about sustainability as part of Solana Center’s Eco Learning Lab at the Del Mar Fairgrounds’ Infield Farm. Banana peels, coffee grinds and eggshells. So often these items pile up in our trash bins. Jessica Toth, Executive Director of the Solana Center for Environmental Innovation, says that over one million tons of organic waste goes into San Diego County’s landfills each year, or 39 percent of total landfill space. Organic waste—in particular food—decomposes in a landfill without oxygen (anaerobically) and releases methane as well as other greenhouse gases into the atmosphere. The Solana Center, however, is working toward solutions. All these food scraps could be turned into nutrient-rich compost instead. The Encinitas-based nonprofit sells composting bins and offers educational classes. Since October they’ve also piloted a community compost program where families take a bucket home and bring it back filled with organic waste. Best of all, when in doubt, anyone can call their Rotline. 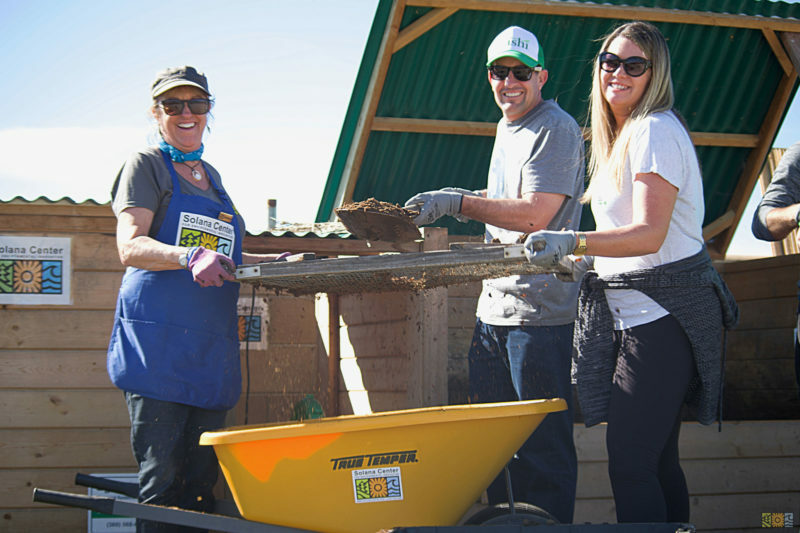 Kashi, a corporate sponsor of the Eco Container, brought 65 local and national employees for a fun volunteer event at the Eco Learning Lab and Infield Farm January 2018. The Solana Center began in 1983 when a young UCSD graduate, Brooke Nash, borrowed money from her parents to buy a truck. She then pioneered the first curbside recycling program in the area. Two years later ‘Solana Recyclers’ moved into an abandoned Encinitas firehouse. Over time the name changed, but the Solana Center’s main offices stayed in the same location. Today the firehouse office is surrounded by a lush garden and compost bins. The Solana Center uses this compost amendment to help grow fruit trees on their property, including strawberry guava, nectarine, fig, plumb, banana and apple trees. Toth explains that plants grown in compost-amended soils tend to be healthier and even require less watering. Until recently, the Solana Center focused on offering classes that emphasized its three pillars: soil (gardening and composting), water (conservation and protection) and zero waste. Within the last few years, the nonprofit has expanded to consult with mid-size businesses, such as restaurants and farms, to help keep their large amount of organic waste out of the landfill. A program unique for the region, it’s a win for the environment and a win for companies. The Solana Center estimates that businesses throughout the county could save an aggregate of $20 million in disposal fees each year. In fact, the nonprofit recently facilitated sending food scraps from a local fast food restaurant over to a farm for composting. The restaurant saved $400 per month due to lower trash hauling fees. Toth is particularly proud of the Solana Center’s work as consultants for the city of Encinitas. In 2016, they reached out to all 240 restaurants and businesses that served food in the city, asking whether they would experience financial hardship if they switched to compostable ‘to go’ containers. Only five answered ‘yes.’ The Solana Center then conducted a public outreach campaign to gain support. By December 2016 the City Council passed an ordinance banning EPS (expanded polystyrene), another word for Styrofoam™, the non-biodegradable material often used to produce ‘to-go’ containers. Environmental Educator & Branding Guru, Ashley Marquez teaches students about Vermicomposting (composting with worms). The Solana Center’s vision has also extended to educational programs for kids. This summer students from throughout San Diego County will come to the infield farm at the Del Mar Fairgrounds and participate in the annual Plant, Grow, Eat Program. Afterwards, thanks to an Environmental Champion’s grant from SDG&E, they will be invited to experience the Solana Center’s newly created Eco Adventure, located in the middle of the racetrack. To welcome kids into the adventure, mealworms will eat away at Styrofoam™ inside a glass case. Students then will explore many hands-on stations from a pirate ship wheel that spins, showing how much water is necessary for making a t-shirt, to a scavenger hunt in search of rainbow radishes. The Eco Adventure also will include SDG&E sponsored buses that bring students from low-income areas to the Del Mar Fairgrounds. The Solana Center hopes to reach up to 5,000 youths throughout the entire phase of the project. 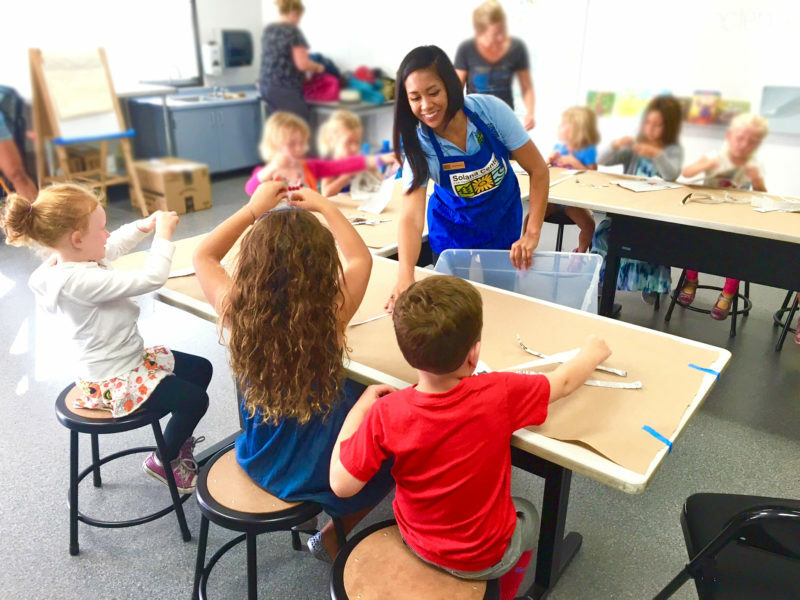 SDG&E, a company that wants to become a model for sustainability, aims for students who might not otherwise receive environmental programs to engage in activities that show how we can all take care of the earth. Director of Education, Diane Hazard leads a tour of Solana Center’s Composting Demo & Training Center for members of the California Resource Recovery Association. 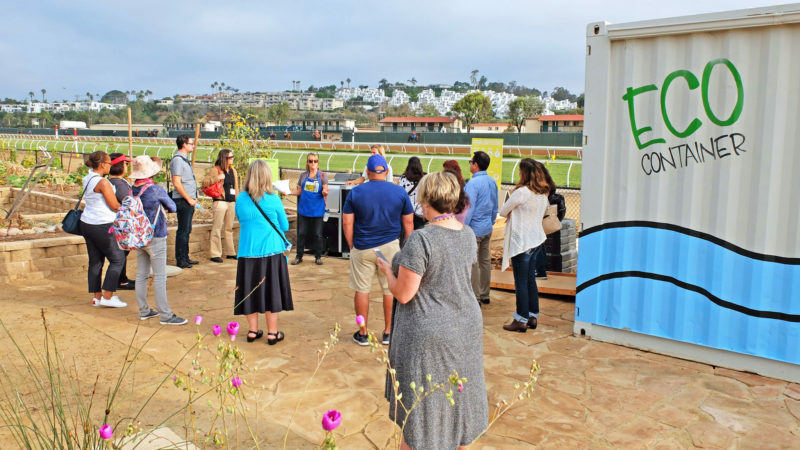 The Eco Adventure is part of a larger project that began about two years ago when the Solana Center opened its Eco Innovation Campus at the Del Mar Fairgrounds. The campus features a mural splashed Eco Container, literally a re-purposed shipping container, with displays inside that inform visitors about sustainability. The campus also has an Eco Learning Lab where six composting stations highlight how mid-size businesses can recycle their food waste using methods such as vermicomposting, bokashi and black soldier fly larvae. The Solana Center has big plans going forward. They hope their compost programs will eventually encompass all Encinitas residences. In addition, they would like to have organic materials from all the city’s restaurants stay out of the landfill. Most importantly, through educational programs like their Eco Adventures, the center continues to nurture a new generation of environmental stewards.